Keith Brown, Cabinet Secretary for Infrastructure. clips the final length of the 30-mile Borders Railway track into place with the installation team. TRAINS will run on the ­historic Waverley Line next week for the first time in nearly 50 years. The start of driver training marks the latest milestone for the Borders Railway, signalling the £350 million project is largely complete. 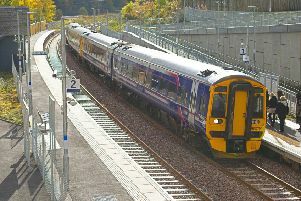 ScotRail will begin running its Class 158 trains, which are due to carry passengers from September 6 between Edinburgh and Tweedbank, south of Galashiels. Training runs for the 60 drivers will involve some four return journeys a day. The reopening of the northern third of the Waverley Line to Carlisle – named after the Walter Scott novels – comes 46 years after it was shut in what was regarded as the most notorious of the Beeching cuts. Closure of the line, which had opened in 1849, left the central Borders as the most remote area in Britain in terms of distance from a railway. The 35-mile route will have seven new stations and includes an existing five-mile section to Newcraighall. It will be the longest line yet to be reopened in Britain. Network Rail, which is building the line for the Scottish Government, said the “core” railway was now complete, with remaining work including stations. Construction has been on time and budget, unlike the overall project, which is some £50m over budget and will be finished four years later than planned when it was approved by MSPs in 2006. Passengers will enjoy the longest daily service on any line in Scotland, with trains running for almost 20 hours from 5.20am until nearly 1am. A giant artwork will also be unveiled near the platforms at Waverley Station to be used by Borders trains. Project director Hugh Wark said: “The core engineering works have been completed, with the track and signalling needed to run trains now in place.